Live updates, commentary and tweets from celebrities! Coverage starts at 6 p.m. from the Red Carpet. Golden Globes winner Jacqueline Bisset in the press room. "Thanks for letting me try all over your movie." Uh..
"I didn't think I was going to win! 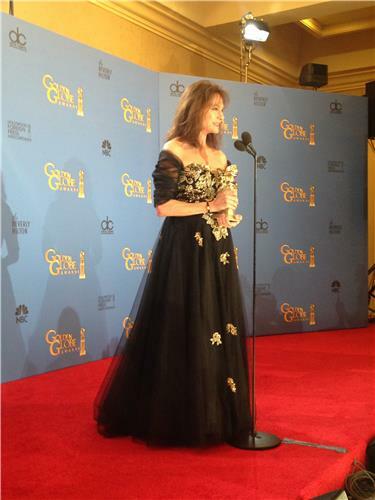 It *did* take forever," -- Jacqueline Bisset says of how long it took her to walk to the stage. "Everybody just keep drinking. It will be over soon." - Sean Combs. Actually, no it won't, Diddy. It's gonna be on for like ever. Alex Ebert (bird's nest) is the lead singer of Edward Sharpe and the Magnetic Zeroes. Please Mr. Kennedy…come on….no Taylor Swift! These guys were the big idea when Diddy drove the big car. Bono and the Edge accepting award for best original song -- motion picture for "Ordinary Love" from "Mandela: Long Walk to Freedom." Yeah, I'll do it twice. U2 may not beat Idina Menzel at the Oscars but with the HFPA? Yeah. Puffy sings "Let It Flow" as they accept... not the most classy thing. Taylor Swift is going to write a song now about her #GoldenGlobes loss. Coming soon in 2015. That song is nowhere near as good as "Free Nelson Mandela." Love that they wouldn't let Diddy get the spotlight. Bono told THR last week: "We were so moved and impassioned by Nelson Mandela's achievements. We knew the man and were honored to be a part of this project." They won't play off U2. The bathrooms at the Bev Hilton, right in that ballroom, are quite nice. so true.. Free Nelson Mandela was the jam!! Original song, motion picture goes to Bono and #OrdinaryLove . #GoldenGlobes Sorry, #Frozen should have won. If Taylor Swift won, I was gonna cut myself. Just FYI. Sorry, Bono. You winning a Golden Globe for your crummy song is not a victory for human rights. 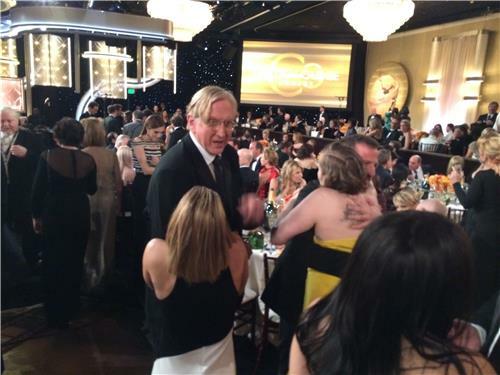 Hayden Panettiere chats with T Bone Burnett while Lena Dunham hugs Spike Jonze. So we just went from U2, to The Who, to Fountains of Wayne. Nice. "Stacey's Mom" is like the 300th best song from Fountains of Wayne, though. Fantastic band. Chicago P.D. is very average. Note. Ooh, another of my categories. Aaron Paul. Jesus. Too easy. Jon Voight? That's robbery right there. Jon Voight ("Ray Donovan") wins best suporting actor in a series, miniseries or TV movie. Listen, Jon Voight is very, very good in "Ray Donovan." But he's no Aaron Paul. This is just the GGs pandering. Aaron Paul robbed...what a joke. Jon Voight?